The Chamberlain Residence is a semi-rural retreat designed by Richard Kirk Architect located in the Sunshine Coast hinterland. 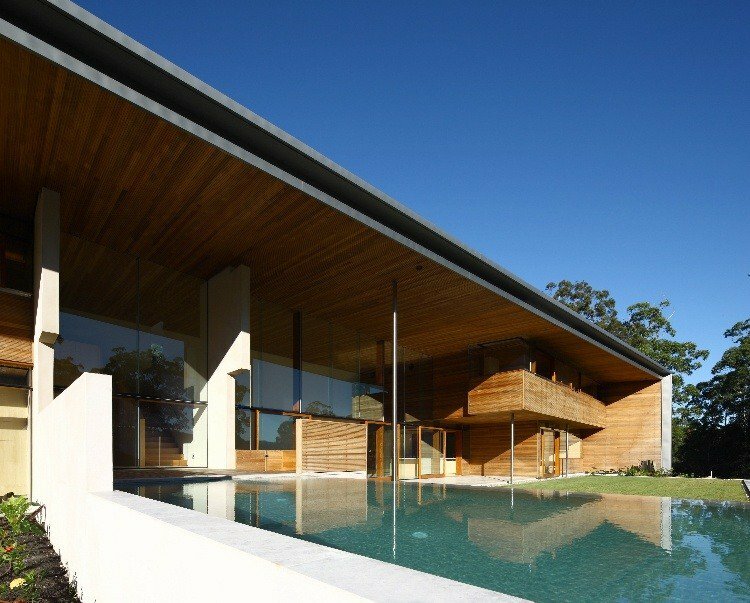 The Chamberlain Residence is a semi-rural retreat located in the Sunshine Coast hinterland for an international Client. Siting of the residence has been carefully considered to respond to environmental conditions, and to control the transition from the designed landscape of the residence to the natural bushland beyond. The central axis of the house is oriented North-South which aligns toward Mount Tinbeerwah – a landmark for the region. The design of the residence continues RKA’s commitment to simplicity of form and planning. There is a great emphasis on material qualities, with a shared commitment between the Client and Architect to produce a residence that will age and improve over time. The palette of external materials consists mainly of off-white cement render, zinc panels and Western Red Cedar cladding which are allowed to weather naturally. Bespoke New Guinea Rosewood timber joinery and Silver Ash timber panelling provide warmth to the interior spaces.